Click image to view full-size version. A forum member from the ValveTime fansite received an email response from Gabe Newell himself confirming that Valve will not be announcing any new titles, but rather showcasing games it’s already revealed. 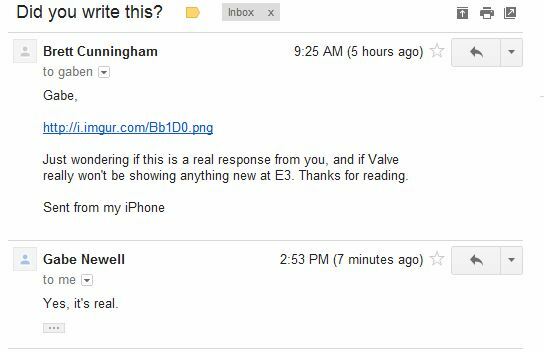 The legitimacy of this email comes into question, and while a second email screenshot from a third party lends credibility to the claim that this message was in fact from Newell, we have yet to receive official confirmation from Valve. Nonetheless, this news is unsurprising, if a little disappointing. Seems the wait for Half-Life 3 continues.